We offer a Free Next Working Day Delivery service between Monday and Friday 9.00am - 6.00pm (Mainland UK Only). If a product is out of stock or special order we will send your order direct from the manufacturer or offer an alternative. In most cases deliveries will be next day but cannot be guaranteed and may take longer, you will be advised of any delay. Orders must be placed before 3.00pm for a next day service. We also offer a next day delivery before 12pm and a morning delivery before 10.30am at additional cost. For the delivery of Batteries we use UK Mail. 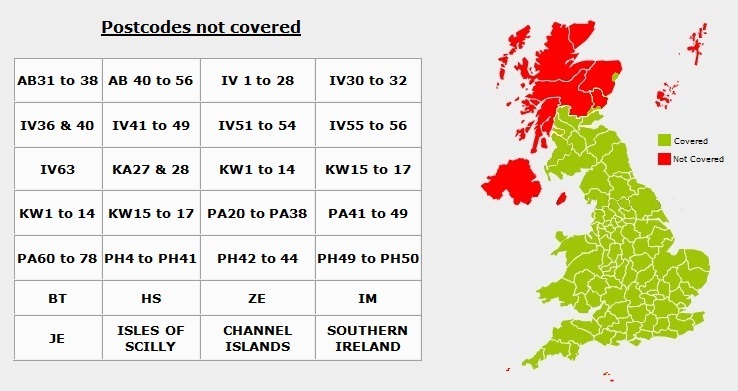 Unfortunately this means we are unable to deliver free of charge to the following areas, However special arrangements can be made to these areas. Please call 0800 999 8444 for further details.